Winter is here and so are fancy winter clothes. 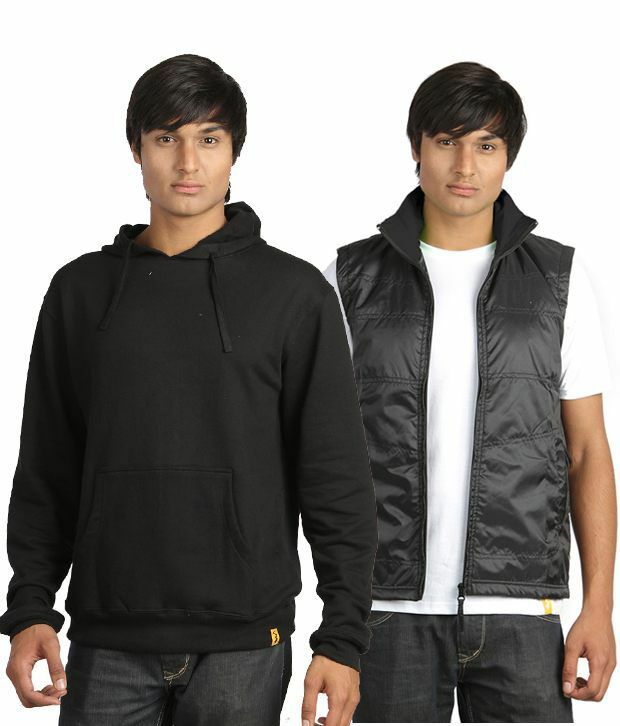 Buy the Campus Sutra Pack Of Black Sweatshirt and Jacket Combo from SnapDeal at an amazing price. Campus Sutra offers awesome designer clothes at affordable prices. The quality is also excellent at the same time. In this combo you get a Sweatshirt with a hoody. The sweatshirt is black in colour and keeps you warm. Wear it while you take a casual evening stroll. The sweatshirt is made of 100% fleece cotton. The jacket is a cool way of flaunting a relaxed version of you. Wear this for a late night party and garner all the attention. The jacket is sleeveless and is made of polyester. It blends well with any jeans and a crew neck Tshirt. The jacket is styled with a collar and adds to your style quotient. Buy this stylish combo of 2 at just Rs. 1153 from Snapdeal. Product Type:Combo of Hoodie and Sleeveless Jacket. Fabric: 100% fleece cotton (Sweatshirt) and Polyester Blend (Jacket). The hoodie suits all weather and looks chick and cool. Color:Black Hoodie and Black Jacket. Neck: Collared Jacket and Hooded Sweatshirt. Sleeves:Full Sleeves Hoodie and Sleeveless Jacket. A jacket is a hip- or waist-length garment for the upper body. A jacket typically has sleeves, and fastens in the front or slightly on the side. A jacket is generally lighter, tighter-fitting, and less insulating than a coat, which is outerwear. Some jackets are fashionable, while others serve as protective clothing.